The Photographs of Archie Chisholm by Michael Cope presents a unique and remarkable archive of photographs produced by Archibald Alexander Chisholm while he was Procurator Fiscal in Lochmaddy, North Uist (then part of insular Inverness-shire), from 1881 to 1913. Archie was a keen observer of people and places and chronicler of events throughout the islands and in all nearly three hundred separate images have been attributed to him. The author’s grouping of these images together by theme rather than just place has allowed for a clear narrative of late Victorian/early Edwardian Hebridean life to emerge, one that has not previously been presented in this way. The photographs were taken in the years 1892 to 1906 when Archie was living and working in Lochmaddy. These were interesting and changing times in the Hebrides – land agitation and the eventual passing of the Crofters’ Act, new steamship communications, development of sporting estates and tourist hotels, expansion of the fishing industry, a major period of church construction and the coming of the first motor transports. This beautifully illustrated book also contains photographs of the same scenes to highlight changes, or the lack of them, over the last 100 or so years. Public auction at Minister’s house in Clachan na Luib, North Uist [Image © NMS]. 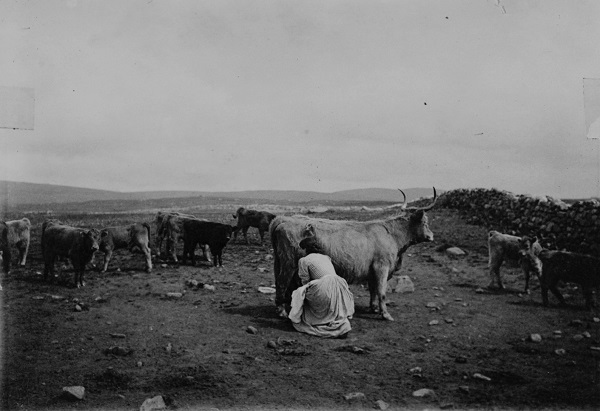 Milking a cow, unlocated and undated, probably North Uist c.1900 [Image © NMS]. 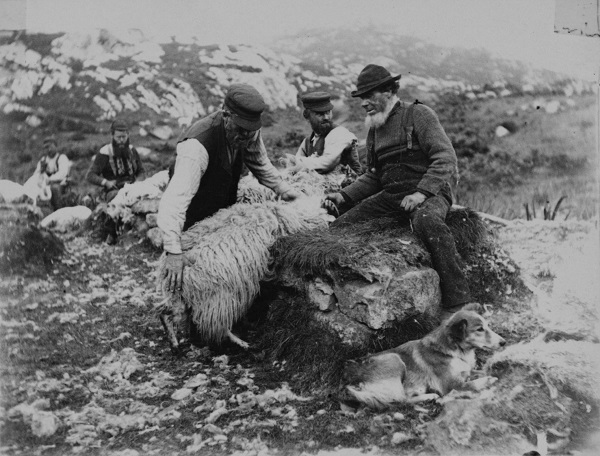 Shearing sheep, probably Harris, c.1900 [Image © NMS]. Shipping a Uist pony at Lochmaddy Pier [Scan courtesy of Norman Hudson]. 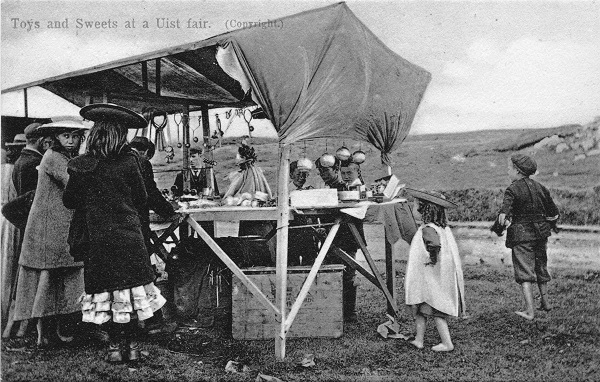 Toys and sweets at a Uist Fair [Scan courtesy of Norman Hudson].